The next morning we woke up early so we could take advantage of our bus tour tickets. For only $6 Canadian, they are valid for 24 hours after you first swipe them. We jumped on the first bus of the morning at 9 am and headed across the river to climb up the tallest (finished) building in Shanghai. 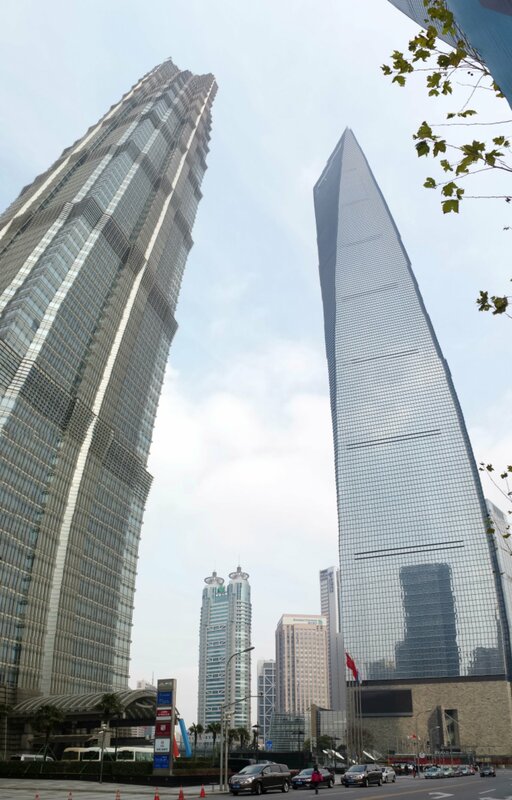 The new tallest building in Shanghai is being built right next door and is already higher! The top of the currently tallest building in Shanghai is shaped like a beer opener or a handbag, depending on your perspective. You can walk across the handle of the handbag when you get to the top and the floor features a few glass sections, which are kind of scary unless you’ve been to the CN tower, like me, in which case they are fairly pedestrian. On the way down from the tallest building we stopped to check out the Hyatt Park which occupies 10 stories between the 78th and 88th floor. Of course the rooms are ridiculously expensive, but they were beautiful and if you want to want to go almost all the way up the tallest building in Shanghai, it’s free to go get a tour of the rooms at the Hyatt. Once we finished up in the tallest building in Shanghai, we headed next to the building that used to be the tallest building in Shanghai until the bottle opener got built. We originally headed into that building to have coffee on a cafe on the 88th floor, but we accidentally headed into another Hyatt right across the street! So this time instead of touring the rooms, we asked about places to eat. 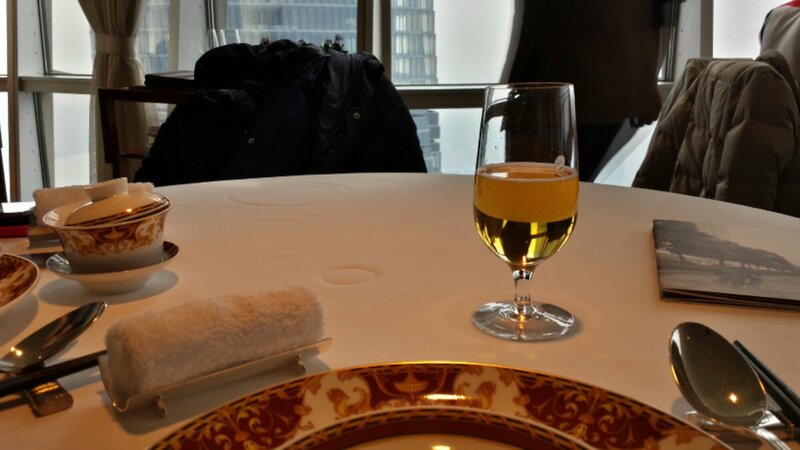 And we found a wonderful restaurant on the 88th floor. Now the food in China is really inexpensive, but this restaurant was not at all inexpensive! But happily, it was entirely worth the money! It was traditional Shanghaiese food and it was exquisite. I also crossed another thing off my list of things to eat in China. Pigeon Soup! I put together a full list of crazy and delicious things I ate in China at some point. After our delicious lunch we hopped back on the bus to head to another part of town to get some gift and do some shopping. Now Shanghai isn’t that cold, but it’s on a river delta and near the ocean, so when it’s close to zero, it feels really cold. Especially when you are on the top level of a open top double decker bus. So once I was thoroughly frozen, we got off the bus and headed somewhere to warm up. After a coffe and some yummy pastries in a heated space, I was finally ready to head back out into the cold to walk through a historic section of Shanghai. The old parts of Shanghai are truly beautiful to walk through. The buildings are built in the old traditional Chinese style and the streets are crowded so that you get the full effect of Asia. This is something I didn’t experience in Beijing at all, since I visited during the Spring Festival most people were already gone by the time I got there and hadn’t returned by the time I left. I didn’t experience any vehicular traffic in Beijing at all, nor was I ever crowded in the subway. I look forward to returning to ensure I get the full experience of bustling Beijing. After a little walking around and some shopping, it was time to head to the suburbs for a family reunion! Family time was quickly becoming my favorite thing about this China trip. Supper featured Zhen’s senior Uncle and his wife. It was hosted by their son and wife and I built a Lego toy with their three year old son! Zhen’s Auntie was there as well with her husband. Zhen’s three cousins from her junior uncle were also there, twin girls and one fiance. The wife of Zhen’s other cousin was also there, whom I had spent New Year’s Eve with. So it was a full house and again, there was a LOT of delicious food and merriment. I was definitely happy that I had learned the chinese phrase gan bei （干杯！） which is like cheers but literally means ‘dry glass’. I was so happy to work on the Lego with the three year old boy since he was the only one I could effectively communicate with. We followed the instructions to assemble the small Lego car Zhen had bought him together. When the car was finished, we played zoom zoom on the floor. It was a lot of fun and I think the family took about 100 pictures of me and Aoa playing. The evening unfortunately ended abruptly as we had to catch the last metro home. It was just as well since it had been a tiring day. Posted from my phone. Please let me know of typos or other errors. Uncle Don on In Beijing! Irina on Happy New Year … all week long!